After leaving the final day of the March Break Camp at St Patrick's today I couldnt help but be amazed by how fast the break has gone by. I know for those of you on sunny beaches or european excursions it's been even more astounding. But the end of the break brings a return to training for championships and the accleration of the final phase of the competitive indoor season and before you know it we'll be on the beach in at camp. So let's take a look at what's coming up. This weekend at the FC site the 16u and 15u girls will host Pegasus and Forest City in a two day training camp designed to prepare these girls for the upcoming OC's but also to extend the branch of friendship that is competitive sport. This marks the third straight season that a training camp of this nature has been hosted by Maveerick teams and from our standpoint it's been a roaring success. So much so that the boys will be running a similar camp over the easter weekend at Algonquin College with Aurora Storm and the Pace Bootlegger club from Rochester. Should be some great ball happening at both sites. The Final competitive weekend is this weekend and our 15u Chargers are competiting and looking to improve their standing for the OC's. Coach Mike Spears is ready to make a run at some of the top teams in his final regular season opportunity. The new 14u Renegades will also be looking to take the court in a friendly series with clubs from the local area. THis post OC pre Nationals tournament will give this fledgling team a chance to see where they fit in to the local landscape. For the older players in our club we have already been signing up for a registering for the 16u and 18u Team Ontario try-outs, which take place in July. Our Club is one of few full service clubs in Canada and one of the great services we offer is Beach Volleyball. We have a competitive program that athletes can choose and get both high level training under the watchful eye of Head Coach Frank St Denis or just sign up for one of our fun developmental beach programs if you are new to the beach. Also coming in April it's official we will be running our first 8 week smashball program for kids 9-12 at St. Peter CHS on Sundays. This program has already filled up and we hope news and reviews will allow us to add this exciting variation of the game to all 5 YM sites in the 2016/17 season. 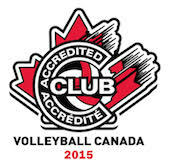 Last I don't think we have made too much noise about this but once again the Maverick Volleyball Club has been recognized as a Volleyball Canada Accredited club for the thrid time since the inception of the award three years ago. Being one of the first in Canada comes with it a sense of pride but also determination to continue to provide for our members. Keep your eyes peeled for new programs like Smashball and Grass leagues coming your way.